AMD recently released the Bobcat line of APUs (Accelerated Processing Units). 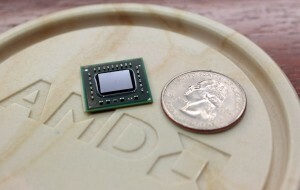 These are part of their new ‘Fusion’ line which integrates fairly simple, yet fast, CPU cores with Radeon graphics. Several sites have benchmarked the Bobcat against the Intel Atom and the results are rather amazing. Engadget has a list of benchmarks as well. The dual core 1.6GHz E-350 dissipates a mere 18W, and containing a Radeon 6310 500MHz 80 core GPU. In various application tasks it handily beats the Intel Atom, and in video tests (gaming etc) its integrated Radeon GPU does remarkably well. Its good to remember that the E350 (and others in its family) are designed for netbooks, tablets, etc. Its good to see AMD taking a bite out of Intel’s Atom. Its this sort of competition that drives technological advances, and makes processors out of date fast enough for CPU collectors to pick them up.